If you are new to blogging, online content writing, and internet marketing, you need this Search Engine Optimization (SEO) Beginners Resource Guide. This guide is especially designed for those who read the previous sentence and wondered, “What the heck is SEO? And what does it have to do with my blog? In short, without proper use of SEO, you won’t see any organic visitors on your blog for a long time. You need to understand (and implement) effective SEO strategies so that your content won’t get lost amidst the millions of other web pages published every day. In the following resource guide, I will explain the ABC’s of SEO. I’ll also include related articles from trustworthy sources so you don’t have to go digging for accurate information. You won’t ever need to look anywhere else to answer your SEO-related questions ever again, just bookmark this page and refer to it every time you need help! More often than not, your answers will be in one of these sources. Also, if you don’t have time to read through the whole thing now, you can download it as an ebook for FREE! SEO is an acronym for Search Engine Optimization. It is the skill, art, techniques, (whatever you’d like to call it) to make one’s web pages appear as high in the Search Engine Result Pages (commonly referred to as SERPs) as possible. SEO represents all the techniques that are used to drive “free” and “organic” traffic to a website from search engines. However, there is so much more you should know! SEO has a huge role in why not everyone plays by the same rules. There are people that just aren’t operating under these guidelines. They are always looking for loopholes, easy shortcuts and other (sometimes illegal) ways to manipulate how search engines work. Chances are you will be competing with some of these people. So, it’s only fair that you know exactly how to distinguish them. The techniques used by White Hat SEOs are generally within Google Webmaster’s Guidelines. That means they are neither illegal nor immoral. They rely on providing the best quality, both in terms of content and user experience. These techniques might take some time to show results–especially for newly launched websites–but if your site has been around for a long time, implementing White Hat SEO techniques will boost your rankings immensely. Like any other field, there is a lovely gray area where people tend to use fishy techniques every now and then. These methods do not directly contradict the Webmaster’s Guidelines, but they do not abide by them either. There are some SEOs that use these gray techniques to boost their rankings a little faster. If you ever find yourself using one of these techniques, trade carefully. One day you might be the No. 1 on SERPs, then the next day you could be nowhere to be found. By now, you should already know what a Black Hat SEO technique is. These are the immoral, sometimes illegal, techniques used to rank your website higher. Although using these techniques may get you the results you wanted faster than both White and Gray Hat techniques, these results do not last for long. Since search engines regularly update their algorithms, websites that have used Black Hat SEO eventually end up banned from results. Some people love to say that SEO is “dead.” They claim that no one uses SEO anymore as it doesn’t get the results, or at least, it doesn’t get fast results. Well, as they say… those people are “dead” wrong! It is true that SEO might not get results within days of implementing it. However, its results are consistent. When you implement the right strategy that works for you–whether it has just been published or it has existed for years–you will see a consistent increase in traffic. Not just an increase in any traffic; organic, free and well-targeted traffic that converts into leads and sells. SEO puts you in front of an audience looking for your services, and you don’t have to pay a penny for thousands and thousands of daily visitors. Also, alongside any great SEO campaign is an equally balanced content strategy. Without the right optimization, that content will be useless. This, along with other reasons, is why SEO will always remain a crucial part of how people find and interact with your content; they can convert into profitable leads. As I have said, White Hat SEO techniques take time to start showing results, but the results last for longer periods of time. On the other hand, search engines are updating their algorithms each and every day so that Gray and Black Hat SEO techniques don’t work anymore. While it is true that these methods still work today, their success rate is dropping; with every new update, thousands of webmasters report that their websites tanked and couldn’t be found in the SERPs anymore. Coincidently, White Hat SEOs report a massive increase in rankings. Therefore, the correlation is clear: Gray and Black Hat Websites DOWN, White Hat Website UP. Each of these branches (On-page SEO, Off-page SEO, and Technical SEO) represents a crucial part of any strategy to rank higher in SERPs. Ignoring any one of them may render your efforts useless. I will discuss each of these branches, don’t worry! By the end of this guidebook, you will know everything about SEO that matters to you and your blog. For beginners, usually the easiest thing about SEO is that you can guess what each branch refers to. On-Page SEO, in this case, refers to the optimization techniques implemented on web pages (in other words, everything you do on your content pages). When you have an outstanding on-page optimized website, search engines are more likely to show your page to users. So, what exactly are you optimizing with On-Page SEO? Everything about on-page optimization revolves around making your content more valuable and understandable by search engines, as well as users. Content Length: Although the length of the content you write depends on what keywords you target, it is generally safe to say that longer content ranks higher in the SERPs. Therefore, the length of your blog posts should be enough to answer the searcher’s queries in detail. Titles and Metas: There is a debate on whether or not these actually influence ranking, but one thing is sure: they influence the Click Through Rate (CTR) and the Average Time On-Page. Think of the headings and the meta-descriptions you use as a way to describe your blog’s content as a copy. In other words, Always Write to Sell. Media: Articles that use different media (such as images, videos and audio) do better in rankings. That’s because users stay longer to analyze and engage with such media, plus it makes content more readable. Keywords: Behind every blog post should be a comprehensive keyword search. When you optimize both text and media to target the right keywords, your content will reach desired audiences. Not only that, but search engines will also have a better understanding of what that blog post is about. Content Form: Similar to length, you also need to always be aware of your content’s form. The way your content looks is just as important as how valuable the content is. Therefore, making sure that your form matches how your audience would prefer to read online content should also be part of all On-Page Optimization efforts. Outbound links: No one can confirm or deny whether the links you have on a page harm or boost your SEO. However, everyone agrees that you should have at least a couple on each blog post. The reason why is straightforward: the audience always wants to read more. They will trust you more if they see that you have done your research and aren’t afraid to show your sources. One of the most important tasks an SEO has is finding the right keywords to target. It is a big part of your On-Page Optimization campaign and audit. Before you can start your SEO journey, first you need to ask yourself: what are keywords? And how do you find them? The answer to these two questions will boost your blogging career like you haven’t seen before. In fact, it may even change the way you write your content. Researching keywords before you start writing an article on your blog will keep you organized and focused on the topic at hand. As you may have noticed in my Nike example, the head term (shoes) and branded keywords (Nike) are too broad. It is in your best interest not to target broad words, as there is virtually no chance of ranking in the search engine. The search volume (and level of difficulty) is very high, but more importantly, their conversion rates are super-low. Long tail keywords, on the other hand, are too specific. Targeting these keywords will work just fine as they are usually the easiest ones to rank. Further, if you wanted fast ranking results, long tail keywords are what to target. The search volume is relatively low, yet it has a higher conversion rate because the user is usually ready to buy whatever they are looking for at this stage. Medium tail keywords are the best keywords to work with, in my opinion. These are keywords that are neither too broad or too branded, so you won’t have to compete with Nike itself, for example. They also are not so specific that they don’t allow you to write longer posts. The search volume is medium, therefore so is the competition. Another great thing about writing and optimizing for medium tail keywords is that you can target long tail (and other) keywords you didn’t know existed. These, however, can be all of the above. They are simply synonym and alternative ways of saying (or asking) for the same results while searching for something on the internet. Example: entering “summer shoes” and “shoes for the summer” will give you the same results, with a possible slight change of ranking. That happens because some pages optimize not only for their target keywords but also for other variations and synonyms of it. Keyword research is exactly what it sounds like: the process of looking up and finding the right keywords to target. The key is to find the searcher’s intent behind a certain keyword, the difficulty of ranking for it and the probable percentage of conversion into leads or sales. Not all keywords are similar, although they may be around the same topic. In the online world, a searcher is looking for one of either two things: information or buying. If I am searching for something on the internet, I will either read about it or I will try to buy it. Therefore, when you are doing your keyword research, you must have an idea of what your article is about. If you are writing an informational piece where you provide free information to your audience, then you have to stay away from targeting buyer keywords. If you are trying to entice your audience to buy a certain product or service, you have to target buyer keywords. To help you out, here is a short list of buyer vs. non-buyer keywords. Please optimize for them with the searcher’s intent in mind. When you have finally selected your keywords, it is then time to define how competitive they should be. But when you have a handful of keywords, the best way to know their difficulty is to rank them through a manual competitor analysis. The goal of keyword research is to ultimately find profitable keywords that you can rank using minimal SEO efforts, yet still get loads of (monetized) traffic. To put it simply, you want to find low competition keywords that will target a large audience and will convert like hell! SEOs like to call these Low-Hanging Fruit Keywords. These keywords do exist, but finding them requires a lot of time and effective research. Have the searchers intent you are targeting. Your On-Page SEO efforts are what will determine if your content is worth being ranked or seen by visitors. Both search engines and your audience expect high-quality content that answers a certain query. If you deliver on that, you will have more chances of getting on top of (and staying on) the SERPs for a long time. Check out the first list of SEO resource guide articles down below to learn more about advanced On-Page SEO techniques, Keyword Research, and Content Writing for a more successful On-Page SEO campaign. There was once a time–and this was a long time ago–when you could write a new blog post, hit publish and watch it rank on top of every search engine. To have any of your pages anywhere on the first 10 pages of the SERPs, your website needs to have backlinks. Off-Page SEO is basically everything you will do outside of your website to enhance your chances of ranking higher in the SERPs. Usually, Off-Page SEO is referred to as linkbuilding. However, it’s not just that. Social Media Marketing and Bookmarking are also part of your Off-Page SEO campaign. These two are usually overlooked; quite simply because they are not considered ranking factors (or at least, not important ones). Yet, when social media is done right, it can bring in more profitable leads to your website. Content Marketing is also a big part of the campaign that’s often forgotten. This is kind of odd since the purpose of an Off-Page SEO campaign is to get your content into the internet wilderness. In this part of the resource guide, I will focus on Linkbuilding (the process of acquiring backlinks) and content marketing, as they are the most effective and important aspects of any Off-Page SEO campaign. It is a very simple process in theory. You go and build a nice, natural backlink profile through various link building techniques. However, link building, no matter how “White Hat” the techniques may sound, remains in a gray area of SEO. The reason is that in Google’s Webmaster Guidelines, link building is listed as a possible reason for penalization. On the other hand, Google cannot deny the power that backlinks have on affecting the rankings in their SERPs. Accordingly, White Hat SEOs will use various link building tactics that are based around providing the best quality content to users, rather than content for the sake of links only. Although following such strict rules will result in acquiring very few backlinks (in comparison with Gray and Black Hat methods), the backlinks acquired are way more powerful. Backlinks are the clickable text (hyperlinked) found on a website that takes a person to another website. It could be either brand mention (such as Nike) or a phrase (such as best Nike shoes). The first one is merely a text that robots would read without fully understanding the meaning (https:// is not a word in any language), while the latter is a text wrapped in href attribute, allowing the robots to know it’s a link. These backlinks are considered a vote or endorsement of a website. Search engines use them to select the most trusted sources and rank them higher on results pages. When backlinks were first introduced as a ranking signal, they were, in fact, equal. However, spammers and Black Hat SEOs messed with the balance when they sent thousands of backlinks to sites they wanted to rank. That was, at least, until the inclusion of Authority, Relevance, and Trust into the algorithm. Authority: Not all domains are equal in terms of authority. The higher authority of the website that links to you, the more powerful (and trusted) backlinks you get. Relevance: The more relevant the website that links to you, the more powerful that backlink is. If the websites in the same niche (or closely related niches) link to your website, that backlink will pass more link juice. Trust: Although domain age may or may not be a ranking factor, domain history is, indeed, taken into consideration when it comes to backlinks. If a domain has been penalized before for spamming, it is understandable that search engines will trust them less. Although backlinks are considered “endorsements,” some of them do not count. As a webmaster, you will have the ability to choose whether the links you put into your articles and blog post should be counted or ignored by search engines. This is referred to as “no-follow tag” (rel=”nofollow”). Every link you add are, by default, “do-follow” (a made-up SEO term for the opposite of no-follow) tags. When you create a “no-follow” tag, you are telling search engines to not count certain backlinks as endorsements. If a website links to you but adds a “no-follow” tag to the backlink, you will get almost no link juice. That backlink is arguably powerless and does not matter in the eyes of search engines. So far, you know that not all backlinks are created equal because of ART and that not all links count. However, there is one more thing to know about them: Not all links are White Hat backlinks that fall within the Webmaster’s Guidelines. There are three types of backlinks that you get to your website when you are doing Off-Page SEO. Natural Backlinks: When your content stands out, someone might mention it in their blog post without your permission or approval. This is usually good for your SEO because it shows that your content is being found and linked to as an authoritative source. Editorial Backlinks: As part of your Off-Page SEO campaign, you might reach out to bloggers and editors at big publications to let them know your content exists. Some of them will like the content and link to it in their own blogs, whether previously published or brand new. Manual Backlinks: These are the backlinks that you place on different websites. You have full or partial control of the anchor text that you use. These can be simple profile links or guest posts link on major publications. Google hates link building for obvious reasons, but they can’t deny it’s effective. Backlinks are in the Top 3 ranking factors. You have to find creative ways to get these backlinks, however. They come by themselves. Although this seems like I am asking you to “Publish and Pray,” I promise I’m not. You will start earning natural backlinks as soon as your brand gets bigger and more recognizable. Content writers will use your content as research material and link to it for evidence to support their argument. However, that will only happen when your blog posts are ranking high on search results pages. And that does not happen without a more effective Off-Page SEO. The most effective backlinks you can have are when you know when and who added them. You have to reach out to editors, bloggers, webmasters or anyone with the ability to edit content on a website. The best way to do this is through an effective outreach campaign and link building strategies that work. You can put your own backlinks on social media profiles, directories and other places online. These backlinks, however, are most likely to be no-follow. Therefore, they won’t really affect your rankings. They may get you a larger audience (from all the different websites your links can be found), but organic traffic remains at a minimum. The only exception is guest post links. Guest post links are usually do-follow backlinks and can improve your rankings, depending on the domains linking out to you. But to get a guest post written on somebody else’s website (big or small), you will need a great outreach strategy. I’ll teach you how to do this down below. When you start an outreach campaign to get backlinks for your website, you have to consider why a certain editor or webmaster would want to add a link to your website. To answer your question, no; relevant content is not enough. You have to be persuasive, assertive and most importantly, genuine. Your content should be unique, informative and interesting enough for the webmaster to decide to link to it. But sometimes, even when all is perfect, you don’t get links and your outreach campaign might fail. That’s because, even though all seemed perfect, something was done wrong. For an outreach campaign to work well, it should be well thought out and it should target the right people for the right reasons. Who am I reaching out to? It is important to know who you are reaching out to. Personalize your email to intrigue their interest. Why am I reaching out to them? There must be a reason why you are reaching out to this person, and a backlink is not it. At least, it shouldn’t be. Why would they link out to me? If your content is the same as everything else on the internet, why would they link to it? If it is similar to a link they already have, why would they link to you? Make sure your content is different, interesting and highly shareable. What’s in it for them? If everyone is willing to link out to you, what are you offering in return? You must have something to bargain with so that everyone comes out of the deal as a winner. Imagine you have written your content and hit publish. You have waited for hours, yet no visitors have landed on your new page. That’s okay, you can wait longer. Days go by and still no visits. Now you start to wonder why no one is visiting your website. The answer is quite simple: you didn’t promote your content. In other words, content marketing is the best way to get the most out of your targeted traffic. Without having such a strategy in place, your Off-Page SEO efforts will have no effect. A content marketing strategy is a strategy that is so focused and strict, it almost eliminates any possibility of your content not reaching its full potential. However, you most likely won’t succeed with yours from the get-go. And creating a strategy for your newly built website is a task that you may not be able to handle right off the bat. As obvious as it might be, it drives more profitable leads for “free” than any other marketing plan. Content marketing targets audiences that need your services or products. Not only does it target them, it also makes sure your content does indeed reach them. As part of your Off-Page SEO campaign, it should come with minimal expenses. Let me put it another way: you pay nothing to reach thousands of people who are more than likely to buy from you. Content marketing provides value to prospects: When you write content, you aren’t trying to sell anything, really. Your audience learns what they want from you without being asked to put their credit card on the table. This helps build trust between you and your future customers. Content marketing produces shareable content: After a prospective client reads highly valuable content, they are most likely going to share it. Thus, they help spread the word about your brand and get you more traffic that can be monetized. Content marketing builds authority, relevance, and trust: Positioning yourself as an authority figure or a brand in your industry won’t come just because you rank high, but because you are well-known. Putting content that is constantly valuable and highly shared will build trust. Content marketing helps you sell without selling: You don’t have to write “buy our product” anymore. Your audience has learned enough from your content, and they are actively looking for ways to repay you. Having a product page on your website and casually mentioning a product or service that you have are more than enough to drive sales. It doesn’t matter how good your content is if it doesn’t reach your audience. Acquiring backlinks and putting together a working content marketing strategy guarantees your content will be seen by search engines and potential clients. You have to write your content with this in mind. Read the resources down below for more on the best link building strategies, outreaching tips and content marketing strategies that will make your blog post conquer the SERPs. As an SEO beginner, you may confuse Technical SEO with On-Page SEO. Don’t be embarrassed, I was confused, too… for a long time. The fact is, On-Page SEO focuses mainly on content, while Technical SEO covers everything else on your website, including content (not in the same way, though). A Technical SEO Audit will have you looking at your On-page and Off-page SEO’s, as well as other aspects such as indexability and speed. In other words, after you finish both your On- and Off-Page SEO campaigns, you make sure both users and bots can access your site without any issues. After your Technical SEO audit, your audience should be able to have an incredible user experience, while bots can easily access, crawl and index relevant pages on your site. But you don’t have to do it all by yourself, there are a lot of SEO Audit tools that you can use to help you out. You might think that means coding, math equations, computer science; but it doesn’t. It’s way easier than all of that. You just have to learn a few quick tricks and you’ll be good to go (for the most part). As you advance, you’ll get around it too. First off, you have to make sure your content is in the best condition. If you have done your On-Page SEO right, then you have already eliminated most of the problems. Otherwise, you will have to discover and fix issues with your titles, meta-descriptions, media, etc. What’s left is making sure there is no duplicate content on your website. And if there is, make sure that the redirect and canonical tags are all in place. You should also look at both the inbound links (backlinks) and outbound links (links to other websites) on your blog posts and pages. They must all be working. No matter how big or small your website is, this part of a technical audit must be done. The more content issues you solve now, the less you have to deal with later. When an audience reaches your website, you want them to stay for as long as possible. And when they leave, you want them to come back. The best way to ensure this is to make sure they can easily find, access and navigate around the website for more content. That means that your website has to load super-fast, be well organized and structured and look good on any device. Increasing the speed of your website can be done by having a cache plugin, minimized images (without losing their quality), having no useless styling code and of course, a fast server or hosting provider. The structure is relatively easy. All it takes is a category widget, a menu bar and links to internal pages on your most popular ones. That way, everything on your website is accessible through your main channels. Your website’s theme should also be responsive to all device sizes. Users should be able to read content on every phone, tablet or desktop they want, no matter the width or height of their screens. For any single page to rank, the web spiders have to crawl through your website and add it to their index. You have to ensure that all crawlers (Google, Yahoo, Bing, etc..) can access your website’s pages and index them. Doing this properly allows online robots to quickly understand your website’s structure and content. This helps them in choosing which pages to show a user when they type in a query. You can use Google’s Search Console and Bing Webmaster Tools to stay up-to-date as to how the spiders are interacting with your website. The two platforms (and many others) will alert you when there are issues that need to be fixed. Although your website’s performance will probably never reach 100 percent, always aim for as high as you can. You should improve your site whenever possible. A common mistake that SEO beginners make is that they ignore the technical side of SEO. However, if you launch a well-optimized website from the get-go, you won’t have to deal with tons of issues in the future. You can have the best content with the best backlink profile on the internet, but if search engines can’t see them, how can they rank it? Making sure your website is fast, accessible and fully indexed is what will make that difference. These resources will help you become the best at performing an SEO audit and explain how everything in the world of technical SEO works. Everything you write about will usually target the entire world. Therefore, your target audience is anyone alive who can read the language you are writing in and is searching for what you are writing about. Of course, if that demographic lands on your website, that’s AWESOME! However, if you own a business in a certain area and you don’t need the World Wide Web to know about you, how would you do that? Local SEO is essentially normal SEO but with a precise geo-target location. If your SEO campaign is good enough, you may rank in both California and the United States. But, your target audience remains in LA. There isn’t much difference between “normal” SEO and Local SEO in practice. The branches, tools, and techniques are still the same. The one difference is you focus on your target location instead of trying to rank everywhere. This helps you focus more on local competition, which is usually a smaller fish to fry than the big sharks of the world. If you have a business that can’t deliver outside of your geo-target location (a plumber who lives in Detroit, for example), then you would benefit more from Local SEO. But if you have an online shop that sells t-shirts worldwide, you don’t need Local SEO. If you have a physical store (example: a car repair shop in Hollywood Blvd. ), you need Local SEO. But, if you have an Amazon Affiliate blog (maybe you review car parts), you don’t need Local SEO. There is no need to compete with international brands or blogs when your target audience is within a specific geographic area, just use Local SEO techniques to rank where you are located! 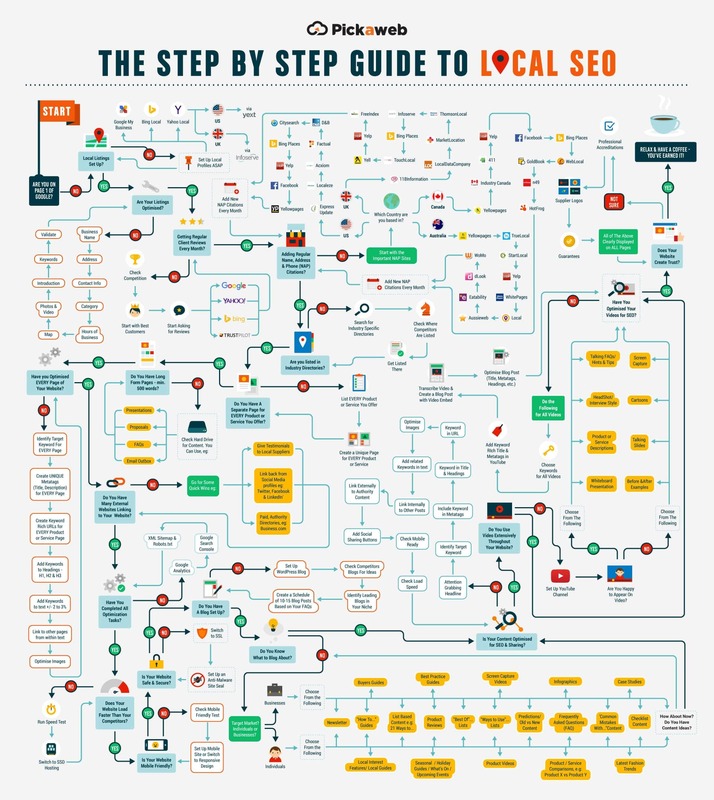 The following resources are the best for Local SEO. Follow the instructions and tips, and apply them to your website for better local rankings. There is no shame in admitting that we don’t know everything. I don’t know everything about SEO. I’ll forever be a student who keeps learning as much as possible. For that purpose, I constantly read new and old blog posts from the industry’s leaders. They are an amazing source of free, valuable information. Although they have paying courses that cost a fortune for the beginners, reading what they have published is more than enough to get you, at least, on the same level as the average competition. Starting out with Brian Dean, the man behind SEO That Works, Backlinko is an amazing source of SEO knowledge. He boasts about having less than 40 published articles while still ranking in the top 3 spot for almost all targeted keywords. Those handfuls of articles, however, are complete guides and long, detailed articles about different SEO concepts. Dean explains techniques and methods on how to acquire backlinks, have a completely optimized on-page, and most importantly, become the best SEO you can ever be. Moz is one of the earliest blogs in the industry. Founded by Rand Fishkin (who recently stepped down from the company), Moz blog is constantly updated with new blog posts. There is a big team of SEO experts involved in gathering the data, analyzing it and presenting it as new techniques and case studies. The best thing about Moz’s blog, however, is the Whiteboard Friday, a weekly episode where Rand (or some other highly experienced SEO) tackles an SEO issue that you may face. They are not trying to make you buy their Moz Tools, but it wouldn’t hurt if you did. Ahrefs is probably SEOs’ most favorite tool to play around with because it has everything that an SEO needs. However, you may not know that Ahrefs’ blog is one of the best blogs in this industry. Tim Soulo’s articles about outreach and link building are pieces of art. You can learn just about anything related to a full SEO strategy from Ahrefs’ blog. Just like Moz, they have an enormous amount of data that they analyze before they come up with a conclusion. So, when you read about a case study done by Ahrefs, chances are they did a really good job. You’ve seen his ads, and you’ve seen his pop-ups. Neil Patel is not fooling around when it comes to internet marketing. He’s probably the best one alive today. Both his blogs (NeilPatel and QuickSprout) have a massive amount of articles to read, ranging from very short and precise pieces to the best guides you can find. The best part is Neil does not focus only on SEO. You can learn so much more from him about branding and social media than anywhere else. He’s not the best SEO to follow, but he may be the greatest at branding. If you don’t find what you are looking in one of these blogs, you are probably looking for something very specific. In any case, don’t just stop at the ones I mentioned above. Check out this list of 40 SEO blogs by Niksto to find exactly what you are looking for. Now that you have checked out all the sources in this SEO Beginners Resource Guide, you’re hopefully saturated with SEO knowledge. You might benefit from a vacation just to get your head around the information you have received (for FREE)! Remember, you can download this SEO resource guide in PDF form, also for free! Let me know in the comments down below, what’s your favorite part of SEO? Make sure to ask me your SEO questions in the comments section, I’ll be happy to answer them for you! Excellent guide – I wish I had read this when I first started! Hi Fred, Thanks for the comment! That’s exactly why I wrote this guide. There is a lot of misinformation out there, and as a beginner, there isn’t much you can do to filter the good from the bad info. Hopefully, with this guide, that problem is solved! Very informative post, I’m a regular reader of blogs like Backlinko and QuickSprout and I’ve learned a lot from them. You’ve shared a detailed guide for beginners to learn SEO easily. Thank you for the comment. I hope you have learned something new from this guide. You’re always welcome to come back and read more articles!